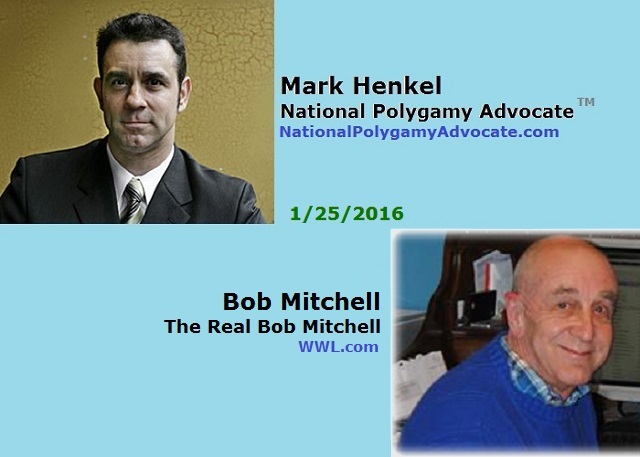 On Monday, January 25, 2016, I was invited as a guest with The Real Bob Mitchell, on WWL in New Orleans, Louisiana, at 2:35 pm local time (3:35 pm ET my time zone). I was asked to share my polygamy expertise regarding the news of Thursday, January 21, 2016, when the “Sister Wives” case, Brown v. Buhman, was heard at the Tenth Circuit Court of Appeals, in Denver, Colorado. The host, Bob Mitchell, is a renowned local fixture on radio for decades. During the interview, he declared how he could not understand how or why any law would be going after people without more than one marriage license. I thanked him and said, “Exactly!” He joked that he would be willing to go to the court and explain that for us! As with other interviews before it, this interview became another useful tool for supporters of unrelated consenting adult polygamy – UCAP – to share when discussing the issues with others.